I came across this today, so if I'm off a bit on my understanding please correct me. I know I shouldn't be surprised, but this was still a bit of "Seriously?" moment when I read it. A farmer is fined for using surplus wheat for his own use, because he won't be buying it as usual and that could impact economy. Curious to know if this ruling has been used nefariously over the years, if anyone knows more please share! Wow that's interesting. I am surprised the supreme court ruled that way. I had a teacher once who was also a lawyer, and he also owned some land that he said "the government paid me NOT to grow barley on". Like simply because he was leaving the land vacant, he was getting paid a stipend to NOT grow a certain specific crop. I still find this such a bizarre waste of money, and I feel this somehow ties in to what you're saying. It makes me wonder if the FDA and whoever else would be involved in this ruling, are in fact co-opted by big agriculture. 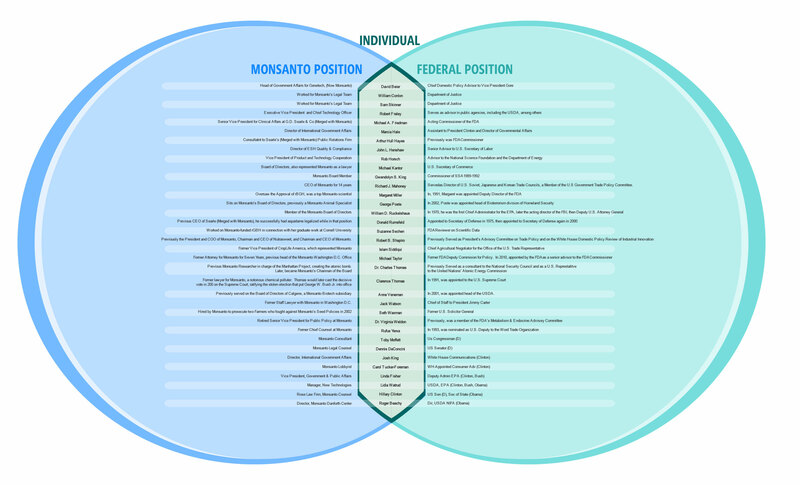 Here it shows monsanto having people from their legal teams becoming federal judges and much more. I am so glad we live in a time where we have the internet to put these puzzle pieces together. So monsanto has been getting their tentacles into policy for 4-5 decades now. Did the Bayer/Monsanto merger go through? Cursory search brought up articles from about a year ago, don't have time to dig at the moment but will have to look into that. The articles are written in a positive tone to inform about investment potentials. I found it disconcerting to read about the level of food manipulation. Maybe it's not unhealthy, but with so much money to be made my bet is that those involved in these projects don't care. Apparently the EU is to decide if the bayer-monsanto merger will be allowed or not. Interesting about the agriculture biotech. I think some of this is like GMOs, which I don't think are unsafe, but the pesticides they put on GMO crops (that they're specifically genetically engineered to tolerate) are what is harmful to the humans and animals, because it leeches into the food. I could envision a similar unintended blowback with this agriculture biotech. And like you said, with so much money to be made, they care little for who they hurt. Or they're so far removed from the consequences they can get away with lying to themselves about it. It's a very interesting topic, that's for sure. D3rr and I have been talking about perhaps starting to do a weekly focused 'town hall' discussion thread, and perhaps this could be one of the weekly focus topics. I agree about the pesticides, at least for the moment. It's been theorized that celiac disease may be attributed more to the pesticides than to the actual food. If GMO's experience a swift uptick, I'm going to be a bit more uneasy though. I think I read at some point about how GMO's were supposed to help solve hunger, both here and in other countries. Instead, they ended up stocking grocery stores with cheap, junkie food. A town hall discussion thread sounds good, I think there are many coming here that would participate. It feels really good here; honest, open and positive. Thanks to both of you!